This is a repost of an article I wrote in 2012. This is one of the things I had in mind when I recently wrote “So you want to discredit an academic field“. It’s super old, so I felt it needed some light editing for clarity, and to remove references to old drama nobody cares about. Journalists are misinterpreting and exaggerating studies. Journalists understand correctly, but pick out terrible studies from a generally reputable field. There are large sections of EP which are just bad, but attract more media attention. EP is rotten all the way through. The trouble is that you can hardly talk about EP without talking about specific examples of EP. And if you only have a few examples, people can accuse you of not having a large enough survey. But it’s hard to investigate more than a few examples, because we’re lazy and/or have jobs. This is a repost of an article I wrote in 2015. It’s just some good old-fashioned making fun of pseudoscientific nonsense. *Apparently, it’s a think tank run by Mark Regnerus. Yes, that Mark Regnerus. 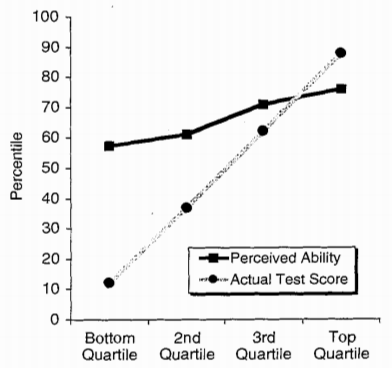 This figure shows results from a test on humor. People are scored based on how well their answers agree with those of professional comedians, and then they are asked to assess their own performance. There were similar results for tests on grammar and logic. The Dunning-Kruger effect has entered popular wisdom, and is frequently brought up whenever people feel like they’re dealing with someone too stupid to know how stupid they are. But does the research actually mean what people think it means? But it is not true. People who know nothing are less confident than people who know a lot. People who know nothing are overconfident relative to their actual ability, but they are still not as confident as people who have high ability.